: Caruso Store Opening / In the Market: "Nail It"
Caruso Store Opening / In the Market: "Nail It"
The Caruso menswear store held its opening last night at the first flagship store worldwide located at 45 East 58th street, across the street from the Four Seasons Hotel. The store, which formerly housed the Spanierman Art Gallery, is comprised of 4,500 square feet of retail space and another 4,500 square feet of office and showroom space. All material used in the store comes from Italy including the old oak flooring, which was elegant and cozy, as well as the veined terracotta tiles that were made from two different color clays imported from the floodplains of the Po River, located in Italy. The clothing is 100% manufactured in Italy by the company's 600 skilled seamstresses and tailors. Caruso is a privately owned Italian company founded in 1958 by Neapolitan tailor Raffaele Caruso and is still based in Soragna, Italy. Umberto Angeloni, the current president and CEO of Caruso, runs the company and he was present as a host of the evening. The event looked like a casting call for a Marcello Mastroianni movie with numerous Italian looking men roaming around in $5,000 suits-why can't American men pick up this aesthetic? Most of the people were unfamiliar except for the ubiquitous Carmen D'Alessio and the famed publicist and Kim Kardashian bestie, Jonathan Cheban. The Caruso motif is based on six different cartoon characters who serve as muses to the company such as Pedro from Buenos Aires, and FeFe from Napoli, who each dress specific to their personalities. 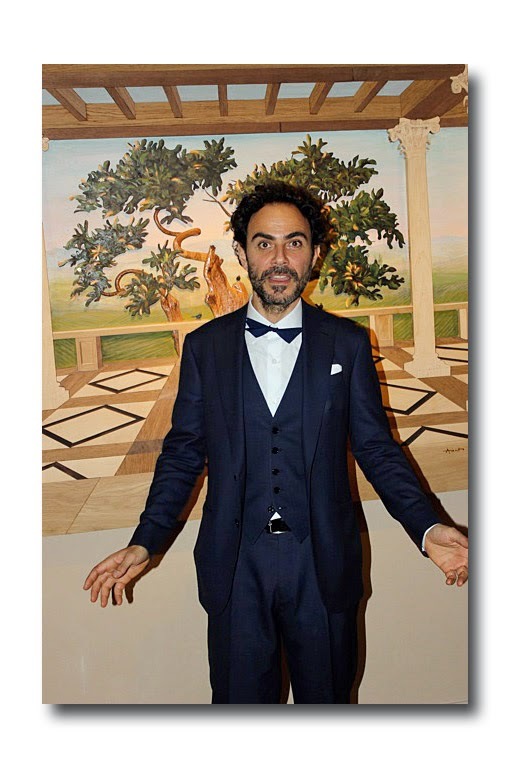 This evening the 20 waiters lined up with drinks were dressed as the figure FeFe from Napoli, with waiters appearing in white tuxedo shirts with tanned aprons and painted-on mustaches. Despite the inclement weather, there was an immense turnout with hors d'oeuvres and drinks served as well as sliced prosciutto straight from a prosciutto maker. Giuseppe Amato, the famed wood artist, who was commissioned to depict a traditional Italian Palazzo overlooking a Renaissance garden in wood inlays, was on hand to change the contents of the painting to welcome in the change of season, a process which will occur twice a year. He also constructed the columns of the store and is involved in the Milan store which will open in the middle of January. The store, which took six months to construct was breathtakingly understated, with super high-end clothing and relatively reasonable prices- the price of a suit costing anywhere from $3,800 to $4,900. Move over Tom Ford and Brioni here comes Umberto Angeloni, and he knows a thing or two about menswear. Mr. Angeloni, who came dressed for success, was handsome beyond words, with an elegance that screams understated perfection. 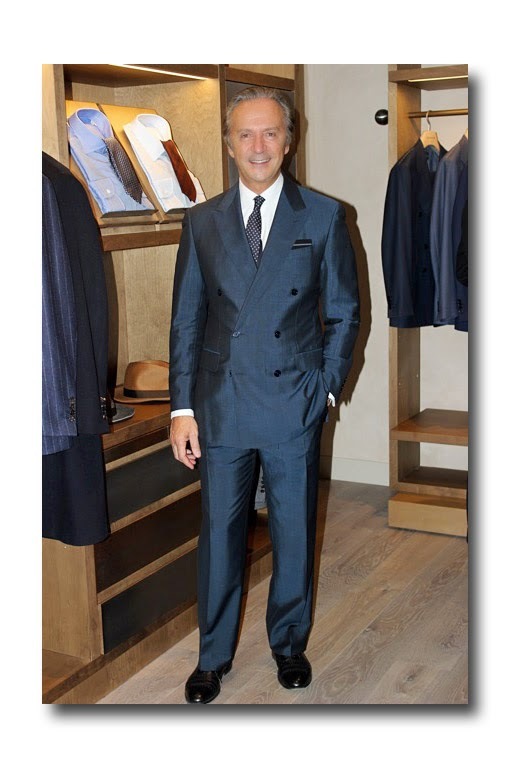 Angeloni, who joined Caruso in 2009, was the CEO and co-owner of Brioni from 1990 to 2007. 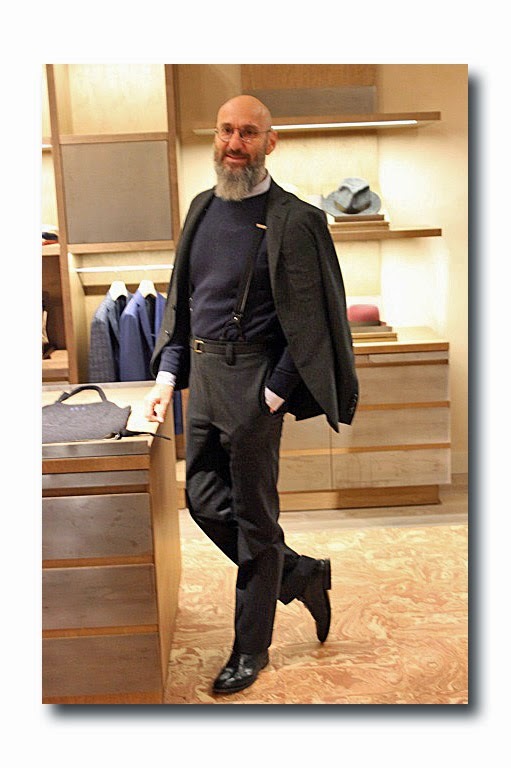 When he started at Brioni in 1990 there was one store and when he left in 2007 there were 35. Angeloni, told me that the Caruso customer was an Italian connoisseur- an educated gentleman who seeks a top quality product. He said Caruso was an evolved Brioni, with a better product value due its cheaper price and based on the concept of functionalism-creating something a man needs in his wardrobe. Furthermore, he does not target a specific age group or customer but rather a certain attitude; someone who does not feel he needs a brand name to feel good. Angeloni seeks a cosmopolitan customer who appreciates the product his exact words being, "a man who understands the quality of fabrics and is above the desire to attain status." Umberto said if he can please the sophisticated Italian, then his clothing will satisfy everyone. Angeloni said they previously sold to department stores such as Neiman Marcus often times using different label names, so he was excited to have a store exclusively offering the Caruso brand. 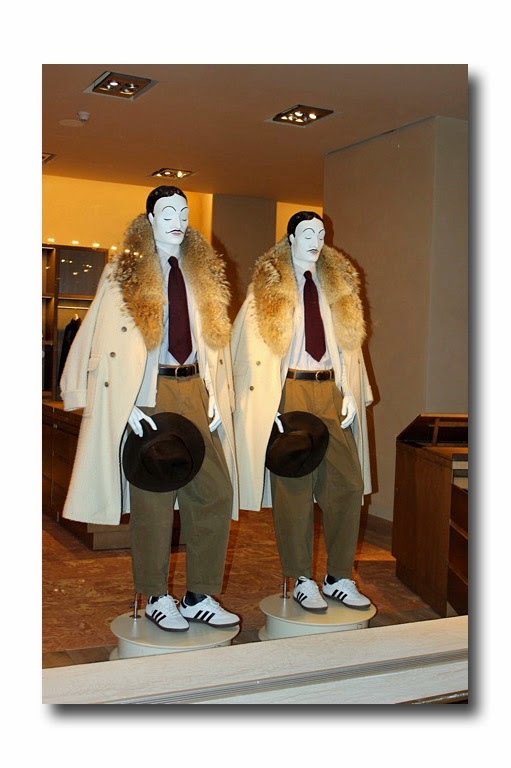 The Caruso clothing was unique and edgy with a classic style-a combination rarely seen. There were blazers in electric blue and flowered coats accompanied by white shirts with bows tied to the collar. When I asked the creative director, Sergio Colantuoni, who looked like a fashion-forward Italian version of ZZ Top, what the concept was behind his designs he said this collection was all about romanticism. Sergio views the jacket as a functional item for a man, placing four pockets on the front, the way a handbag would be utilized by a woman. He said "versatility and functionality" were of utmost importance to him and then showed me the uniqueness of the collection which contained reversible $400 hats and $1,000 silk pajamas as well as leather aprons utilized as vests, numerous cashmere capes and a reversible raincoat. The pride Sergio took in his designs was palpable and his specialty he said was in "designing one wardrobe for many different characters." As the evening came to a close and DJ Marjorie Gubelmann stopped spinning tunes, the crowd reluctantly left this exciting New York event. A salesman handed me an "essential pocket square"; an item which provided space for some credit cards and cash, but was small enough to be placed in a jacket. This object was paradigmatic of the designs of the Caruso label-innovative, creative and incredibly cool. So, you know how manicures never seem to last? Like clockwork, mine start chipping the next day (or that same day). This is especially annoying and noticeable when the color I have selected is a bright or deep red as the chips are most glaring. Anyway, I was looking down at my chipped red nails when I got a phone call from Betty Ann Grund, a former colleague at Harper’s Bazaar: she was a highly revered senior fashion editor (who had worked under Diana Vreeland) when I arrived as an assistant in 1970. We bumped into each other at “The Editor’s Eye: Iconic Images from the Anthony Mazzola Years” retrospective at the Hearst Tower last month, and she explained that she was Brand Advisor for Brand Cap Advisors (www.brandcapadvisors.com), a company that bridges the gap between the creative and the commercial. Among the designers the fashion editor turned professional brand consultant turned brand entrepreneur has discovered: Marc Jacobs. And she has promoted, merchandised, and marketed brands including Donald J Pliner, Perry Ellis, Proctor & Gamble, Revlon, Alberto Culver, and Ron Chereskin. Well, talk about great timing. Her latest venture is an innovative luxury nail lacquer company, Mine (www.minelacquer.com), whose handmade, innovative, high tech and artful formulas guarantee there will be no more chipping. Actually, Betty Ann had just done a test run on herself and she reported that three weeks later, her nail polish had stayed on! Mine Lacquer is the brainchild of Veleta Vancza, a renowned and accomplished artist (with an impressive resume), goldsmith, enamellist, licensed nail technician and tech savvy nail enthusiast. Her extensive research and technical skill in metallurgy resulted in Mine’s quick drying formulas which are not only luxurious (making use of the finest raw minerals in the world) but 5-Free (they’re free of the 5 toxic ingredients found in many other nail polishes). Unsurprisingly, they do not come cheap (this is more than several cuts about good old Essie). Prices range from $75 to $500 retail for bases, top coats, and lacquers in a range of precious, shimmery metals (24K Gold, Fine Silver, Pewter, Aluminum, White Gold Leaf, Crystal, etc.). Designed by a jeweler, you could think of them as jewels for your nails and they could not be more holiday perfect when you want something festive, out of the ordinary, and special. And speaking of the holidays, each one is gift ready and superbly packaged in a beautiful Austrian crystal bottle. By the way, should you want something really exclusive, the website enables you to customize your own lacquer (price on request). For more information, contact bespoke@minaatra.com, tel: 845 687 9354. 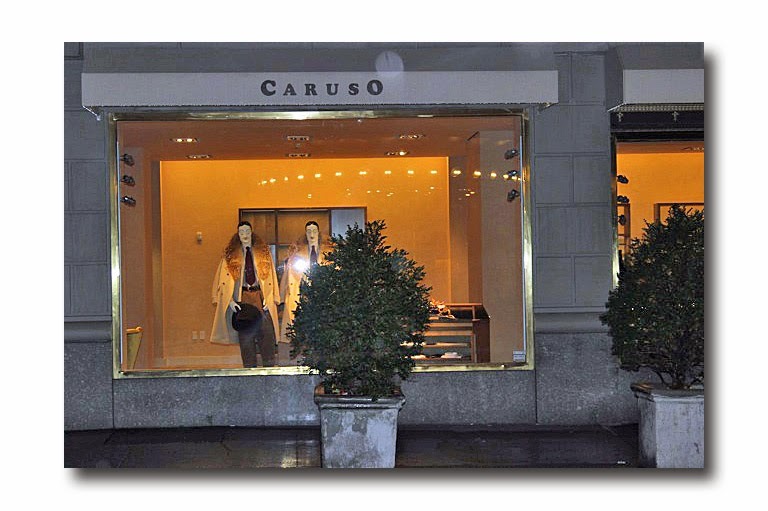 Labels: Caruso Store Opening, In the Market Report: "Nailing It"